With a vision to promote safe-adventure tourism, the 14th ATOAI convention highlighted adventure travel with its theme “Adventure Travel: Future Challenges and Opportunities in the digital age.” The convention showcased potential stakeholders, tourism boards, tour operators and twenty Everest summiteers from the adventure travel fraternity. Keeping the tradition of exploring the emerging hotspots of potential adventure tourism, the 14th convention of the Adventure Tour Operators Association of India (ATOAI) was held in Araku Valley, Andhra Pradesh (south Indian state). The event not only aimed at establishing adventure activities available in Andhra Pradesh but also focused on creating new opportunities, networking, discussing business and influencing safety policy. The three-day event (January 17- 19) witnessed 300 plus delegates from adventure travel fraternity, industry players state tourism boards, local stakeholders. A pre- familiarised trip was organised for the delegates that also had sessions on ‘Customer Loyalty’, ‘Women in Adventure’, ‘Brand Positioning’ and more. A state tourism presentation was conducted to educate the travel agents and tour operators on Andhra Pradesh’s unique and new tourism and adventure offerings to attract inbound tourists. The annual convention was supported and hosted by Andhra Pradesh Tourism with a focus of promoting adventure tourism in the state. The state holds a record of twenty Everest Summiteers who were also invited and felicitated in the convention. 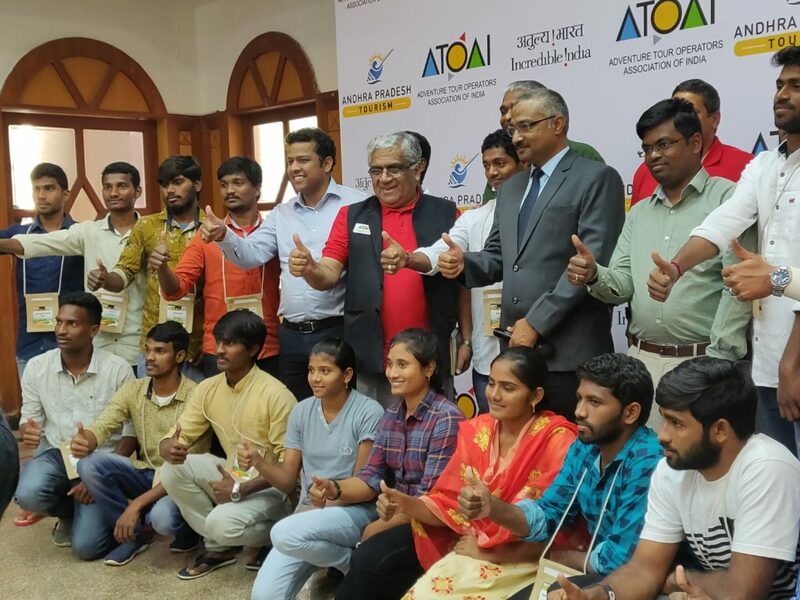 ATOAI members with Ministries of Tourism Department, Government of Andhra Pradesh, during the press conference. “We are excited by the buzz it is creating in the fraternity and is enthused by the widening prospects of adventure travel beyond the Himalayan frontiers. ATOAI is ready to lead this movement,” said Capt. Swadesh Kumar- president of ATOAI. Araku Valley has an unfathomable beauty that lures travellers with its breath-taking landscapes and has a plethora of activities that spell adventure. The place is abundant in natural resources including caves, hills, gradients, water bodies, that makes it an emerging travel destination. Amidst the sessions and business talks, the delegates experienced the world of adventures in the valley like para-motoring, zip line, high ropes, zorbing, kayaking and hot air ballooning. The highlight of the convention was the participation of women adventurers with a focus on shifting from corporate to adventure travel as a career option. While the exhibitors, tour operators, state tourism boards came together to promote adventure tourism, ATOAI urged to take up safety policy and standard guidelines to all the stakeholders from the adventure fraternity as to focus on an adventure-filled safety experience.